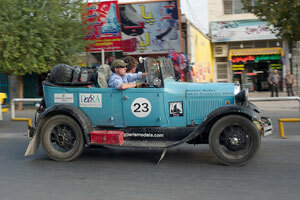 “It’s a bit like the Mille Miglia,” said Rudi Friedrichs, the Alvis driver who was among the first to arrive at Gorgan at the end of a long hot 600 kms drive. People waved, children cheered, police cars gave impromptu personal escorts through towns to individual cars…and whenever a rallycar stopped, a crowd quickly grew of admirers keen to welcome the Peking to Paris. It has been totally organic, a warmth that only comes from impulsive and impromptu response to a rally driving through a community. When Clerk of the Course Kim Bannister stopped at a petrol-station to refuel the diesel Toyota pick-up, a truck driver at a nearby pump put his nozzle into the Toyota, filled our tank, and then refused any payment! Extraordinary stories of similar generosity have filtered through the rally ranks now that we are arriving in the hotels in Gorgan. Hugo Upton and Nigel Gambier were welcomed by two teenagers on a motorbike who performed long wheelies, balancing precariously on one wheel right alongside their Lagonda as they left traffic lights coming into town here. Our day started early, and it was another very hot day in bright sunshine. We climbed up a smooth tarmac road that swept and turned around the side of a mountain to reach the exit-border of Turkmenistan. There were no declaration papers for immigration, and it took some time for these to be found… it was just the start of the typical border frustrations. 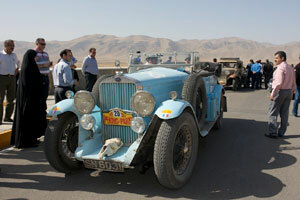 At the entry to Iran, we were greeted by local members of the Iran Motor Federation who had turned up to give us a display of their own classic cars, and there was a loud round of applause when the first few cars inched their way through into the final compound. We have been helped extensively in our organisation here by the Iran Motor Federation who have carried out a brilliant logistical exercise, as all cars were excused the need for a Carnet de Passage, and lots of pre-planning to help ease our way… at every town we were saluted by police patrolmen parked up by their cars, clearly whoever carried the route-authorisation on our behalf has done a thorough job. The first 300 kilometres was through stunning countryside, brilliantly-smooth tarmac… as one driver remarked, “it’s the same grade of tarmac you see at race circuits like Silverstone”, and we found ourselves driving through deep mountain valleys, and at times had the road to ourselves. It’s the first time since Beijing the cars have been on perfectly smooth tarmac roads of real quality. A real driver’s road, the moment you leave the border. We have reached the town of Gorgan, near the coast of the Caspian Sea, and tomorrow see some more of Iran. Ah, understanding the ways of Iranian red-tape is not something that can be understood in an instant.